Pennsylvania has over 4 million acres of land open to hunting, accounting for roughly 15% of the state’s land. In addition to state game lands and state forests, nearly all of Pennsylvania’s state parks have land set aside for hunting. 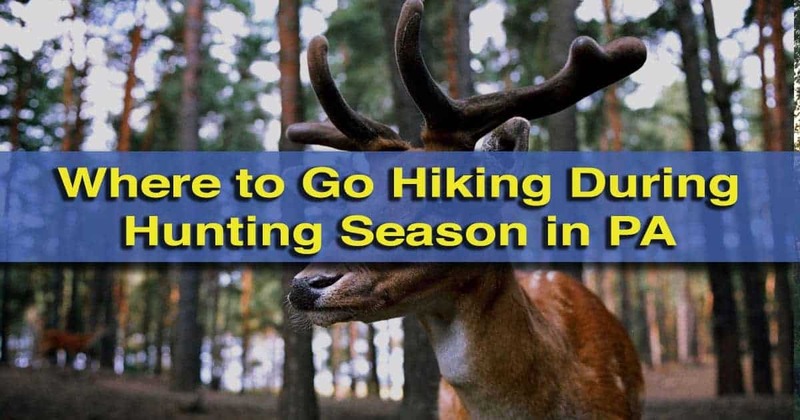 This can prove to be a challenge for those wanting to go hiking, especially during Pennsylvania’s peak deer hunting season, which runs for 13 days starting on the Monday after Thanksgiving. During this time, only the Sunday in the middle of the season is closed to deer hunting. This two-week period at the end of November and the beginning of December can present a challenge for those wanting to hike throughout the state. While hikers are permitted on hunting lands during this time, many would prefer to hike only in areas where hunting isn’t allowed. No matter where you go hiking during hunting season, it’s a good idea to wear some orange. Of course, hunting is allowed throughout the year, and some limited hunting is even allowed on Sundays. For a full list of the state’s hunting seasons, check out the PA Game Commission’s website. 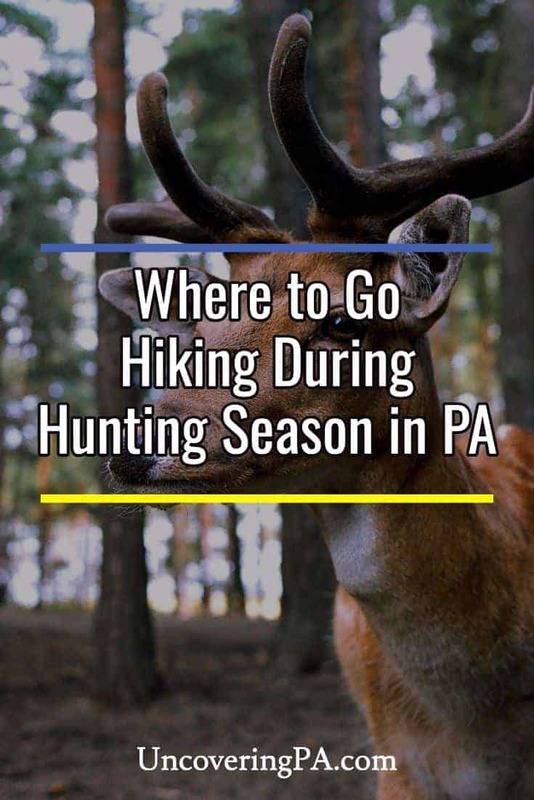 However, where can you go hiking during hunting season in Pennsylvania? Below, I’ve put together some of my favorite places to go hiking in the state throughout the year that don’t allow hunting. However, it’s worth noting that many of these places are adjacent to hunting lands. Therefore, it’s always a good idea to wear some blaze orange to help yourself be seen in the woods (You can easily buy blaze orange on Amazon [Affiliate link]), even if it’s not deer hunting season. 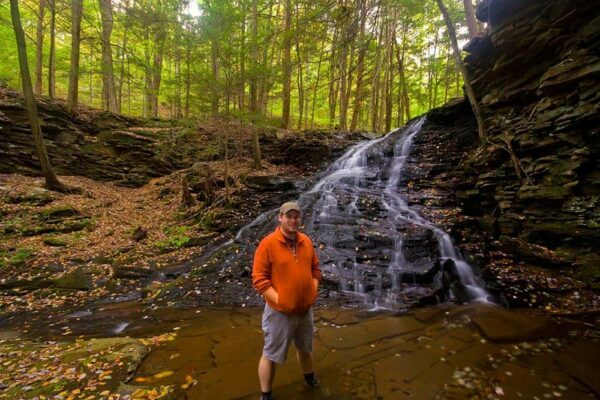 Here are a few great places to go hiking in PA during hunting season. (Note: Always use extreme caution when hiking in areas near where hunting is allowed. While I’ve made every effort to ensure that information about where hunting is allowed is correct at the time of publication, I can’t guarantee that things won’t change in the future. Always contact the park directly to check if hunting is closed in the area you are planning to hike if that is a concern). 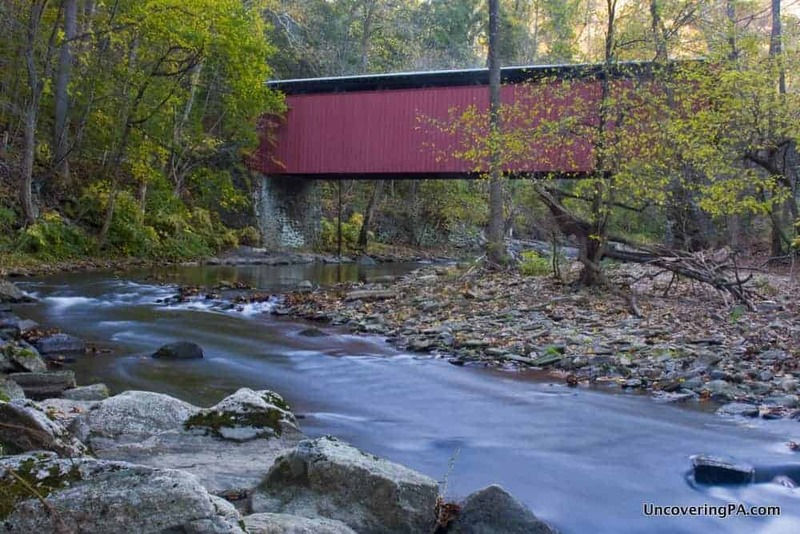 The land around McConnells Mill Covered Bridge is closed to hunting. 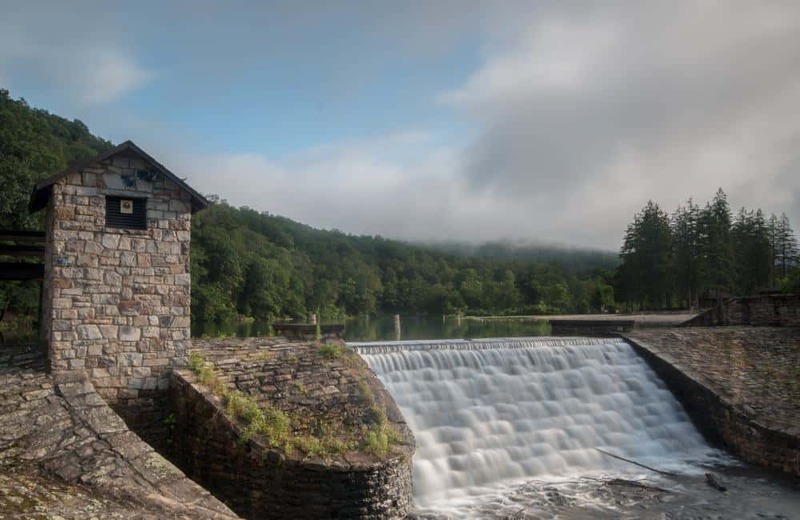 McConnells Mill State Park is one of my favorite parks in PA, and while much of it is open to hunting, there are also great areas to visit that are closed to all hunting. This closed area centers around McConnell’s Mill Covered Bridge and the trails along Slippery Rock Creek. From Alpha Pass in the northern end of the park to Eckert Bridge, visitors can hike without having to worry about hunting. This is a great area to visit during hunting season as you will not only get to see some of the park’s most beautiful scenery including the covered bridge, mill, and Alpha Falls, but you can also do a loop hike on the Kildoo Trail and an out-and-back hike on the Alpha Pass Trail. The boardwalk to Dingmans Falls offers two great waterfalls and no hunters. While much of the Delaware Water Gap is open to hunting, the boardwalk to Dingmans Falls is a great destination during the season. 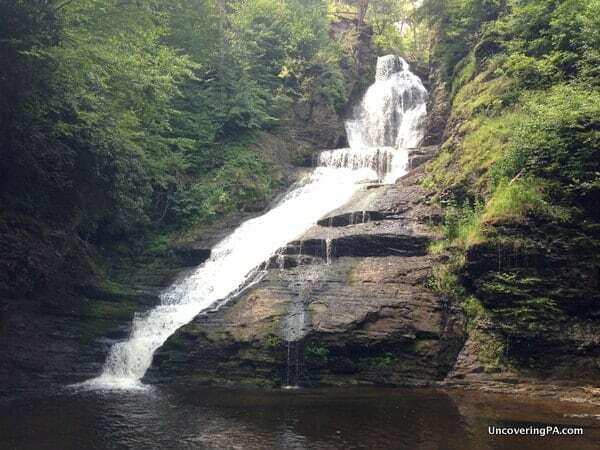 Along this path, visitors can see two of the most impressive waterfalls in PA, including Dingmans Falls, the second tallest waterfall in the state. Keep in mind that the road to Dingmans Falls is closed after the first major snowfall of the year, so depending on the weather, it may not be possible to drive up to the waterfall. The entirety of Philly’s Wissahickon Gorge is closed to hunters. 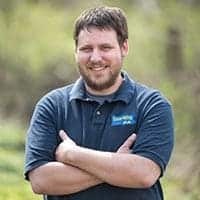 The Wissahickon Gorge is located within Philadelphia’s city limits, but feels a world away from the hustle and bustle of the city. 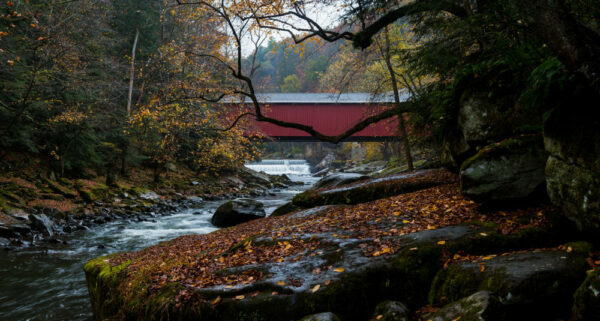 It is also home to more than 50 miles of hiking trails, a beautiful covered bridge, and even mountain biking trails. 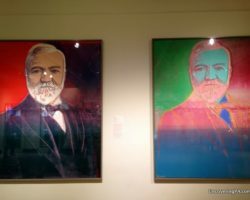 If you are looking for inspiration for where to hike in the park, check out my top suggestions for things to do in Wissahickon Gorge. 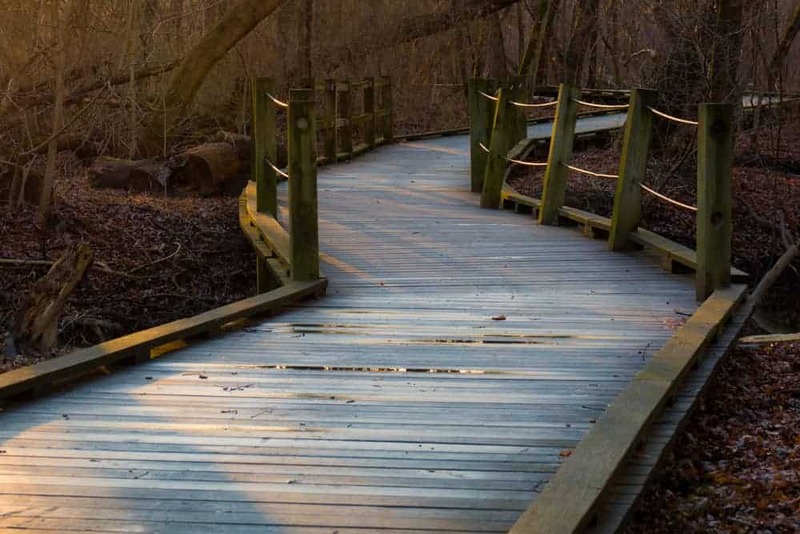 A wooden boardwalk winds its way through Harrisburg’s Wildwood Park. Harrisburg’s Wildwood Park is another city park that doesn’t allow hunting. Visitors can hike along the shores of the lake. A three-mile trail encircles the lake, with several optional paths taking visitors through the woods and into hidden corners of the park. While visiting, don’t miss the remains of the canal that used to run through this area all the way to Pittsburgh. Greenwood Furnace State Park is an overlooked gem. 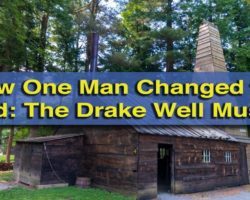 Greeenwood Furnace State Park is located just a few miles south of State College and is one of the most overlooked and historic state parks in Pennsylvania. While much of the park is open to hunting, the Lake View Trail, which trails around the park’s small lake, passes entirely through land closed to hunters. After hiking around the lake, don’t miss the historic remains of Greenwood Furnace. 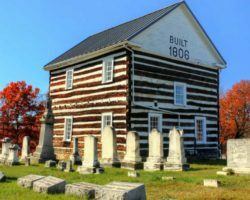 These buildings and iron furnaces offer a fascinating glimpse at the history of the region during the late 19th and early 20th centuries. Presque Isle State Park in Erie is closed to hunting for all but three days of the season. Presque Isle State Park is Erie is the most visited state park in PA and also one of the natural wonders of Pennsylvania. This peninsula features beaches, hiking trails, and much natural beauty. These unique features make it a fantastic place to hike as, generally speaking, hunting is not allowed within the park. However, it’s worth noting that there is a small deer hunting season here, typically three weekday mornings. During this time, the park is closed to non-hunters. In 2017, hunting will be allowed during the morning from December 5-8. 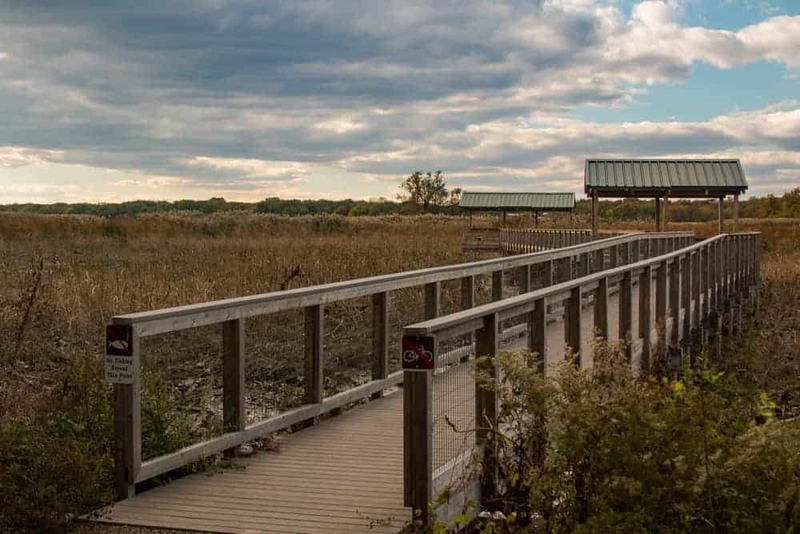 A walking trail in the John Heinz National Wildlife Refuge. The John Heinz National Wildlife Refuge is located in southern Philadelphia, and offers many miles of great walking along the shores of the largest remaining tidal marshes in Pennsylvania. 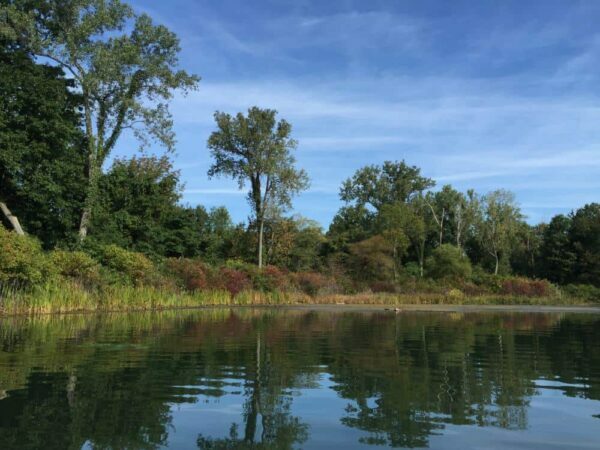 Hikes around the lake offer a great look at the natural beauty of the city, as well as the birds that live in the city. Given its city location and proximity to the airport, no hunting is allowed in the refuge, making it a great choice for hiking during hunting season in Pennsylvania. 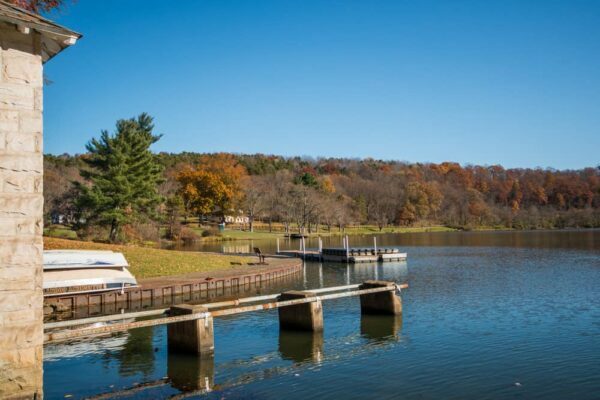 North Park is a fantastic choice for those looking to hike near Pittsburgh during hunting season. While many of the parks in Pittsburgh are closed to hunters, none of these areas are larger than North Park. Located outside of the city limits, and, unsurprisingly, north of the city, North Park features over 3,000 acres of public lands. 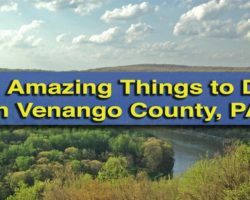 Visitors can enjoy the shores of the large lake, hike in the woods, or even try out Gravity Hill, all without having to worry about hunters. The trail around the lake offers a great long-distance hike during hunting season. Roughly half of Linn Run State Park is closed to hunting, including the area around Linn Run State Park. Linn Run State Park is a beautiful destination near Ligonier in Pennsylvania’s Laurel Highlands. About half of the park’s 612 acres is closed to hunting (all of the land on the northern and eastern sides of the main road). 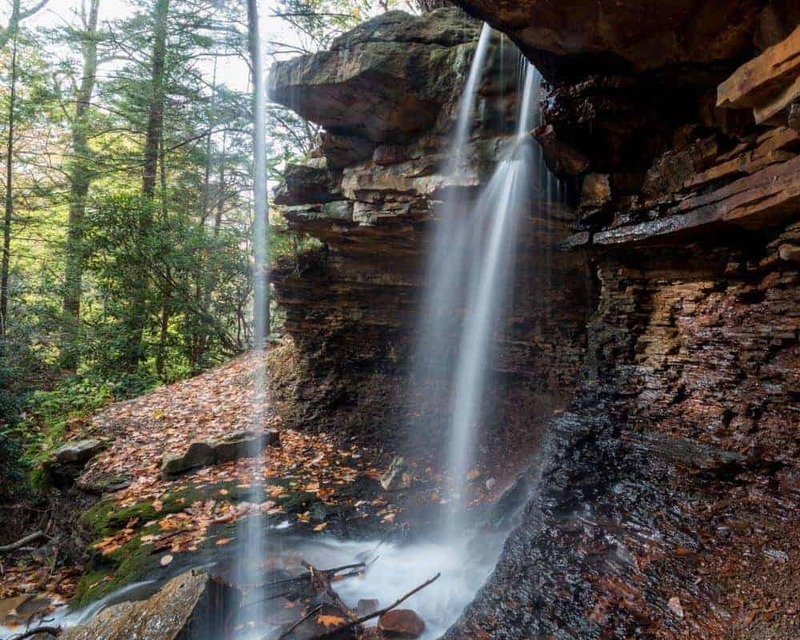 This includes Adams Falls and the Adams Falls Trail, along with the Flat Rock Trail and Iscrupe Trail. It should be noted that the land surrounding this area of no hunting is open to hunting, so wearing a bit of blaze orange is definitely recommended. (Reminder: Always use extreme caution when hiking in areas near where hunting is allowed. While I’ve made every effort to ensure that the information about where hunting isn’t allowed is correct at the time of publication, I can’t guarantee that things won’t change in the future. Always contact the park directly to check if hunting is closed in the area you are planning to hike if that is a concern).